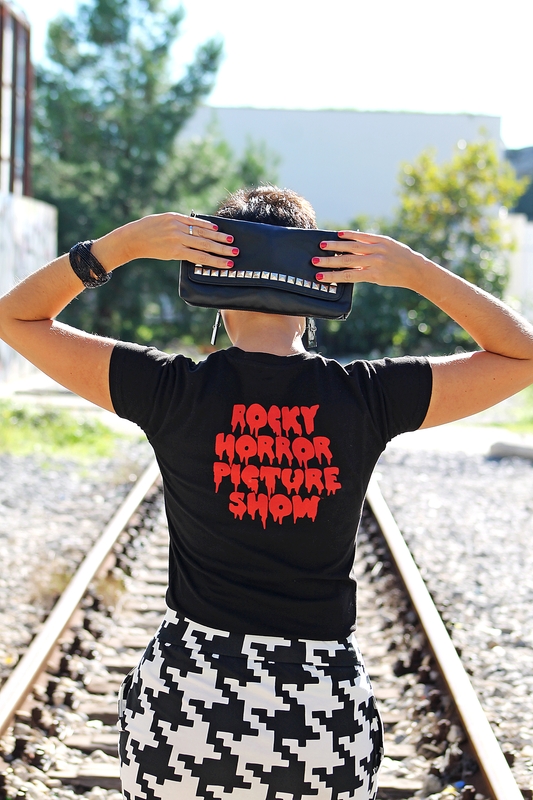 Today – an homage to one of my favourite movies – The Rocky Horror Picture Show. If some crazy scientist would approach me with an idea of time travelling, I would tell him without any hesitation: „Take me to the 70s, pretty please! !“ All that over-the-top glam, outfits, men and women in satin, jewelry and make up – I absolutely love it! 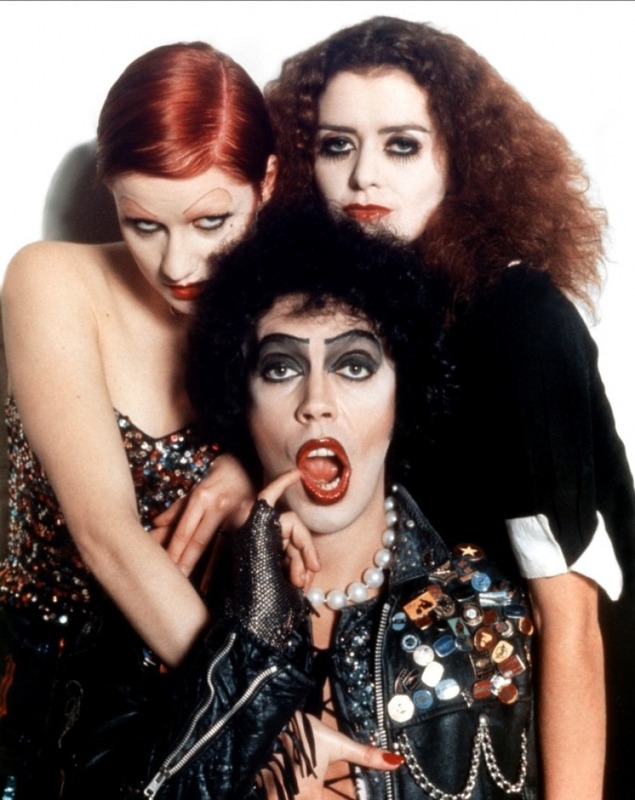 Rocky Horror is a true example of mid-70s glam. But behind all the make-up, platforms, and cross-dressing outfits, are extraordinary music performances, which are still amazing as they were almost 40 years ago! 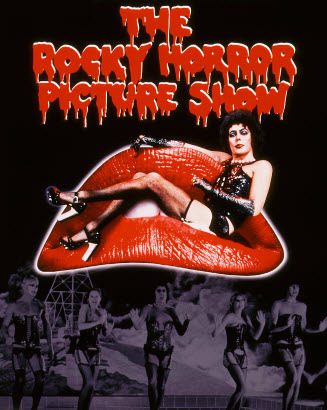 The Rocky Horror Picture Show is a 1975 musical comedy horror film, and an adaptation of the same named stage musical. 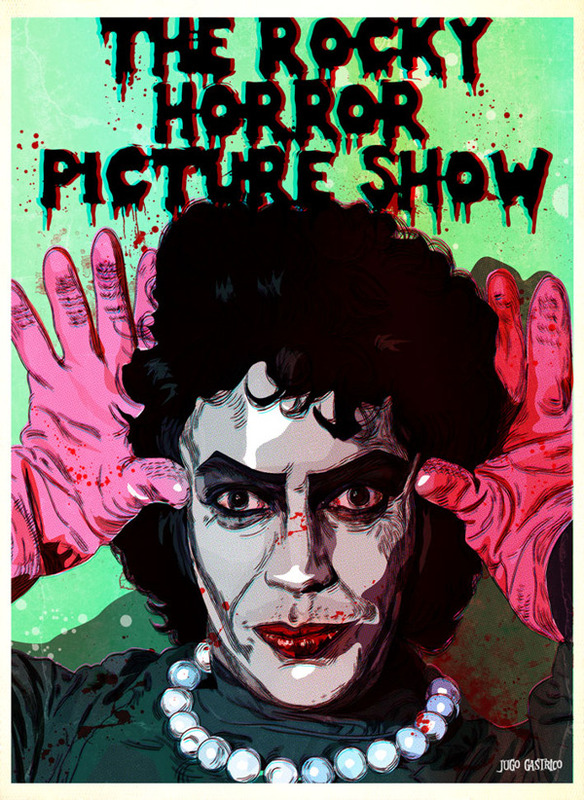 It is a humorous tribute to the science fiction and horror B movies of the late 1940s with main star Tim Curry in the role of the mad scientist Dr. Frank-N-Furter. Film received positive reviews from film critics mostly due to Curry’s extraordinary performance and singing (not to mention walking in high heels like he was born with them)! Story develops around newly engaged couple Brad and Janet (played by young Susan Sarandon), who find themselves lost on a cold and rainy night. In a nearby castle they discover a group of strange people who are holding an Annual Transylvanian Convention. They are soon swept into the world of Dr. Frank N. Furter, a mad scientist and a transvestite who claims to have discovered the “secret to life itself”. His creation is Rocky, the perfect man. The film is considered to be the longest-running release in film history. It has never been pulled by 20th Century Fox from its original 1975 release, and it continues to play in cinemas. It gained notoriety as a midnight movie in 1977, when audiences began participating with the film in theaters. By mid-1978, Rocky Horror was playing in over fifty locations on Fridays and Saturdays at midnight. 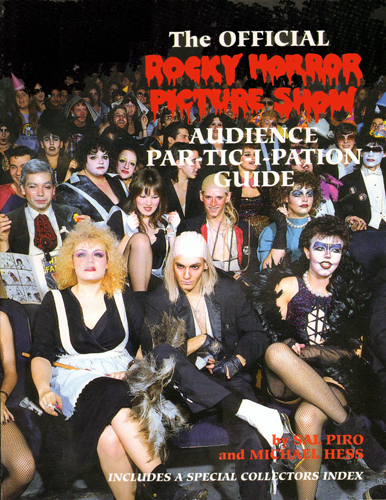 Fans gathered for Rocky Horror conventions, and by the end of 1979 there were twice-weekly showings at over 230 theaters. The film has a large international cult following, mostly because of fan participation. Some cinemas have a tradition of regularly playing the film on a particular date, especially on Halloween. Over 200 showings of Rocky are found worldwide. Many people develop over time into die-hard fans. During the song “Time Warp” in many theatres nearly everyone stands up and does the dance. In Paris, where it’s been shown twice a week for 20 years, the audience makes puns not only around the audio dialogs, but also with French subtitles. Those who haven’t experienced Rocky Horror “live” are considered “Virgins”, often having a ‘V’ marked on their foreheads with red lipstick. Depending on the theater, Virgins will be called out, mocked, made fun of (usually in a good-natured-but-vulgar way) and encouraged to participate in party tricks and games that might be considered racy or demeaning. In 2005 the film was selected for preservation in the United States National Film Registry. Special thanks for pictures and all around support: photographer Andrea, Split and Miss Stella. This entry was posted in Uncategorized and tagged 20th Century Fox, Frank-N-Furter, Halloween, Iron Fist, Rocky Horror, Rocky Horror Picture Show, Sisters of Mercy, Split, Susan Sarandon, Tim Curry, Time Warp by Miss Dee STyle. Bookmark the permalink.